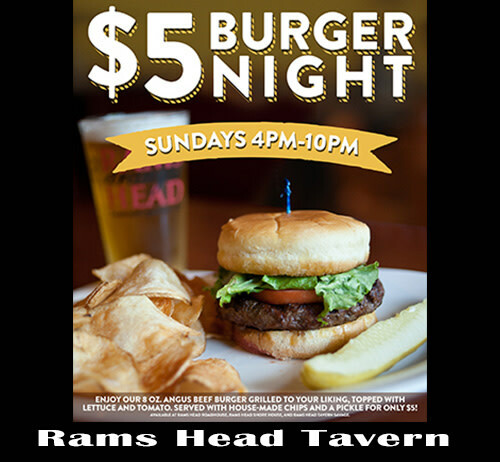 Serving up delicious burgers every Sunday night for just $5! Enjoy great food, cold beer and a friendly atmosphere in our historic English-style pub or cozy dining fireside or outdoors on our Wisteria covered brick patio. Voted best happy hour & beer selection with more than 100 beers on-site featuring Annapolis’ Fordham Brewing Company. Rams Head is open 365 days a year Monday–Saturday from 11 a.m. to 2 a.m., Sunday 10 a.m.–2 a.m. and serving brunch from 10 a.m. to 2 p.m.